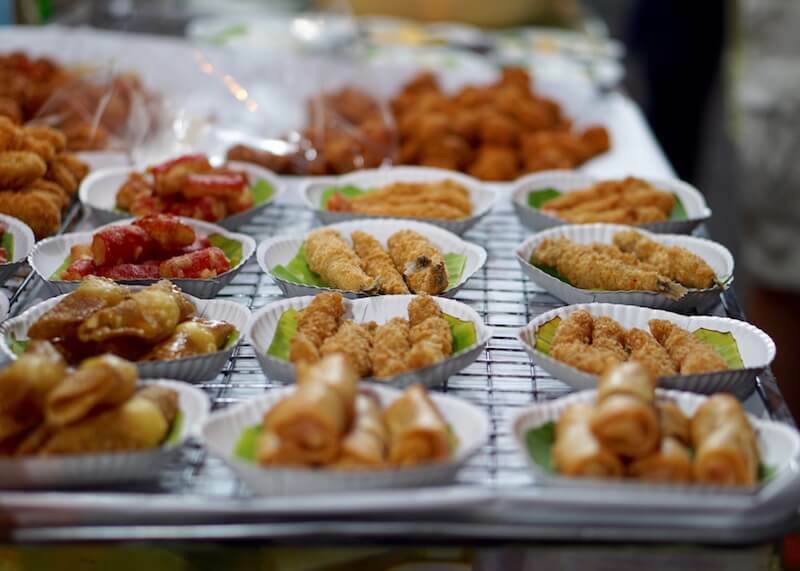 When I was planning for my Chiang Mai trip and pondering about all the food I will get to try, I did not put much thought into sweets and was pleasantly surprised to find a decent variety of desserts available. I found that in past travels, South Asian countries aren’t big on super sweet stuff, which is what I prefer. 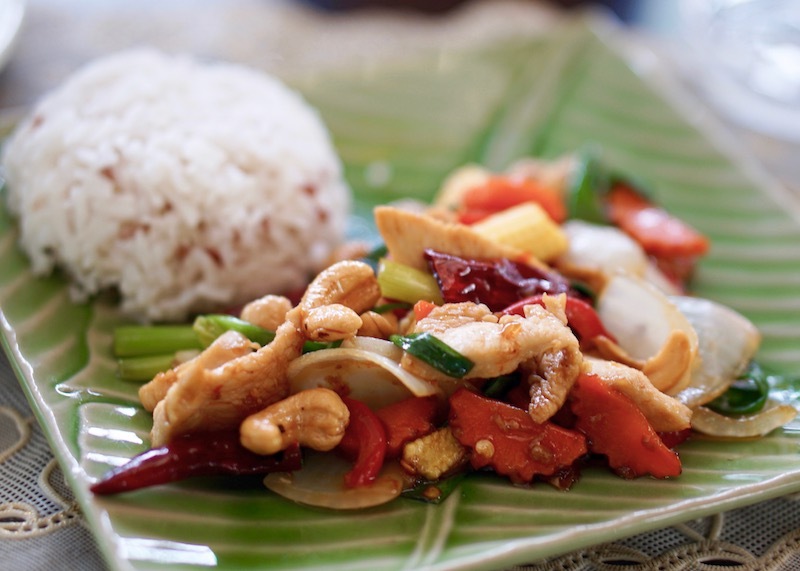 Rather, their desserts are simpler and less sweet, like fruit or sticky rice. 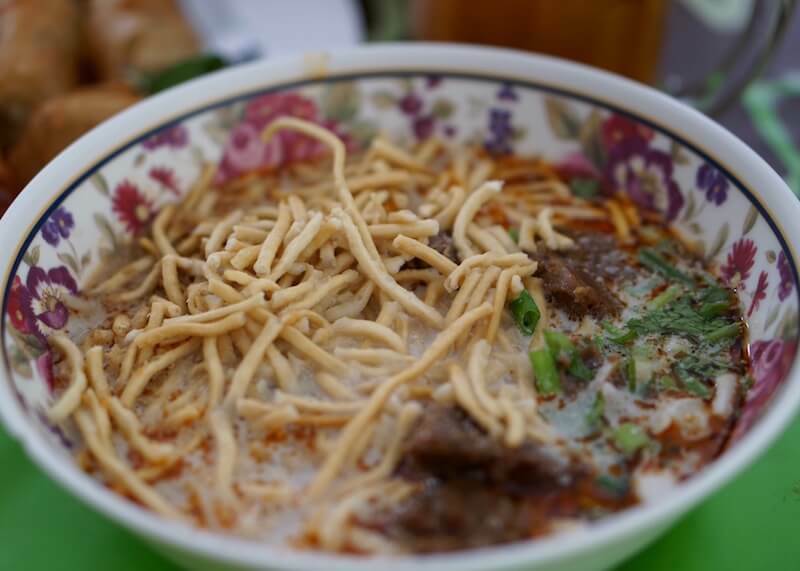 Luckily, that’s not the case in Chiang Mai. 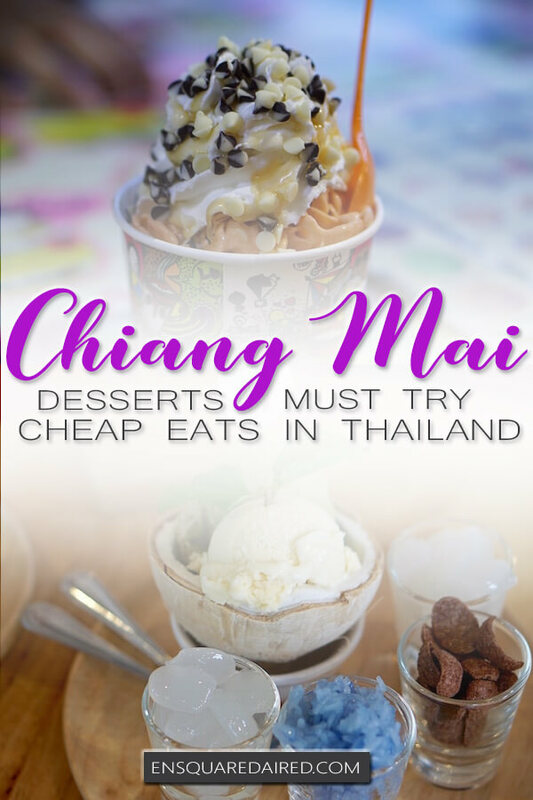 Read on to see my list of the best desserts in Chiang Mai! 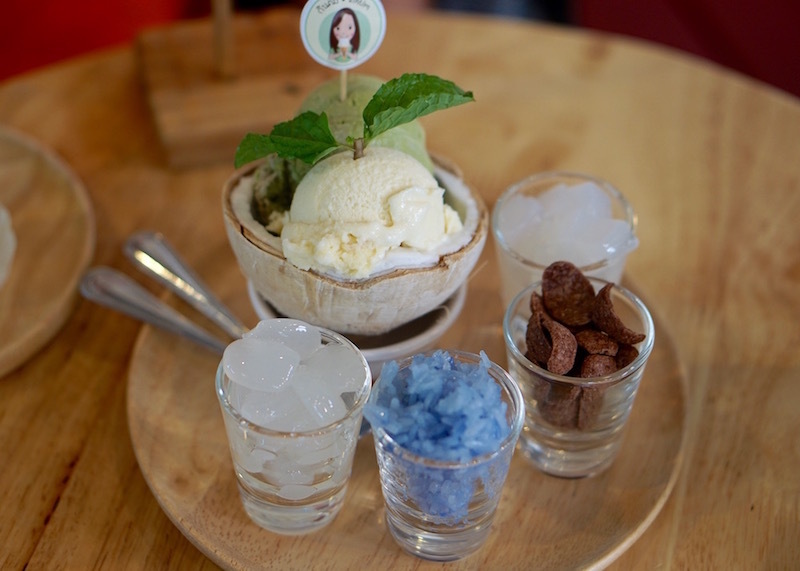 Coconut ice cream in coconut shell is common in Chiang Mai, but not so with toppings. 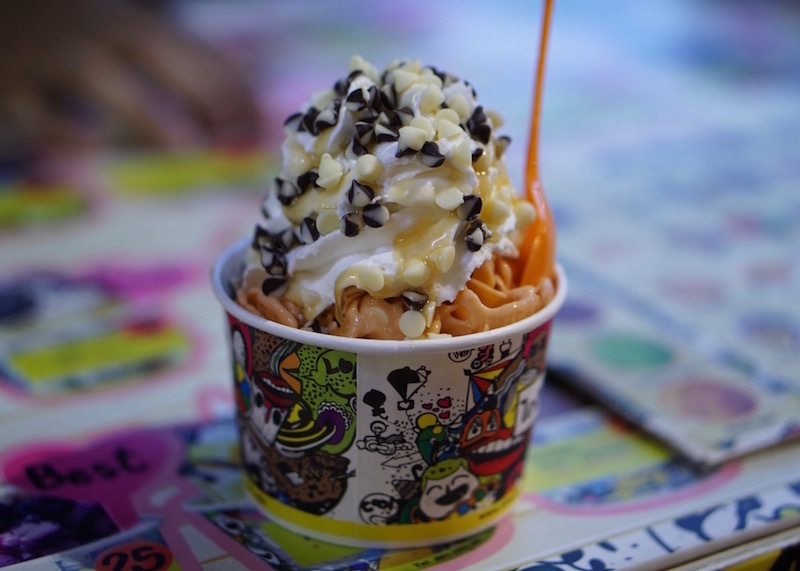 Kintim is one of the few shops that serves ice cream in cute arrangements and offers many side toppings. I chose palm’s seed, blue sweet sticky rice, Koko Krunch and coconut jelly to compliment my coconut ice cream. Update: Kintim is no longer running, but you can easily find coconut ice cream in Chiang Mai for a fraction of the price. Since I don’t live near any Haagen-Dazs shops in Toronto, I have a ritual of eating ice cream from this brand at least once whenever I am in a country that has Haagen-Dazs shops. 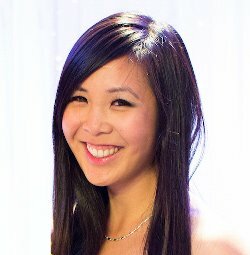 I call it my annual vacation treat; that’s my excuse. 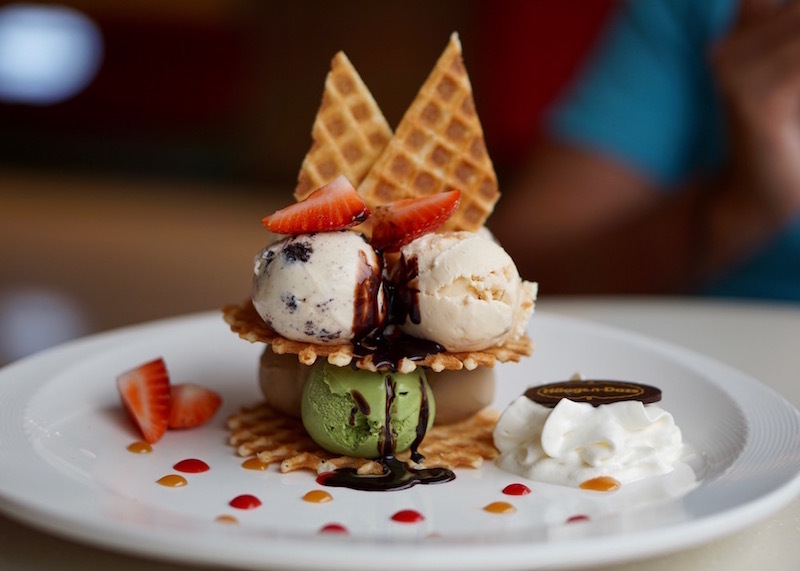 Thai-stir fried ice cream is often said to be the freshest ice cream you’ll eat, since it is made directly in front of you once you put in your order. 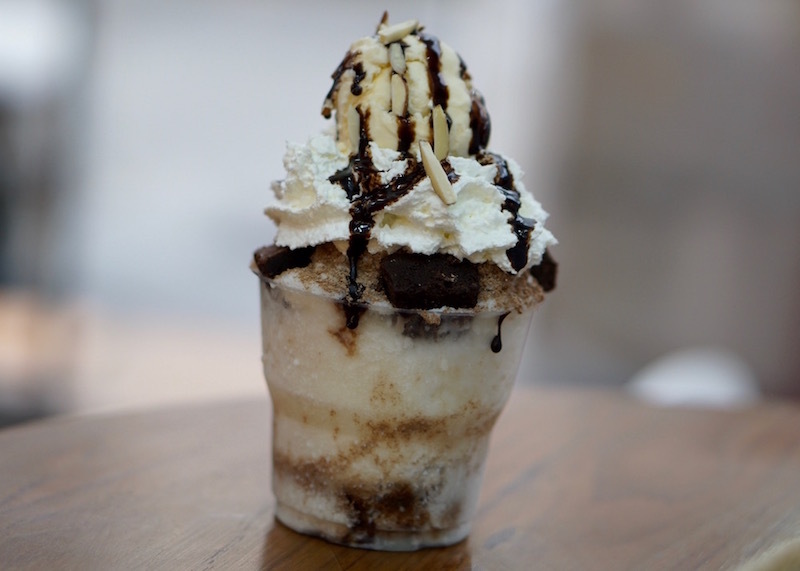 This cold dessert is made with milk poured on an ice grill and mixed with different toppings of your choice. Once the milk hardens into ice cream, each slab is then rolled into wafer-like shapes and served in a cup. 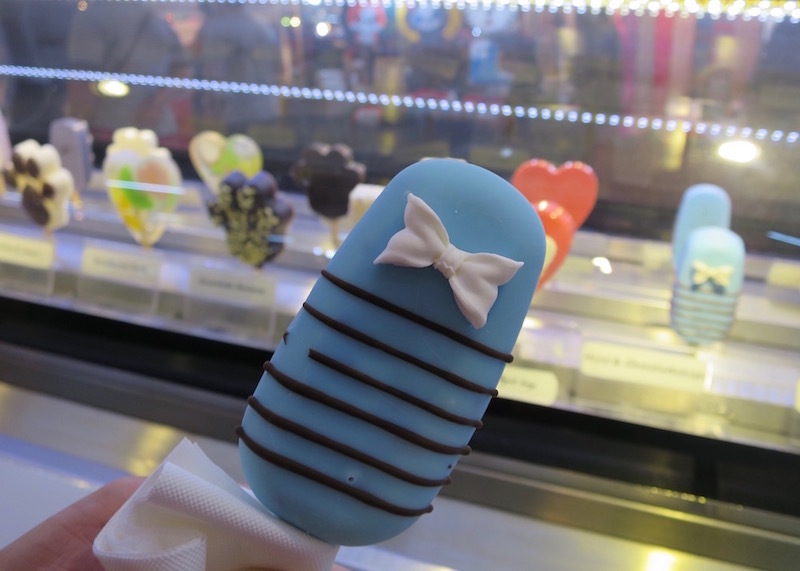 If you’re not in the mood for ice cream in a cup, you can easily find ice cream popsicle (s?) in super cute shapes and delicious flavor combinations. Chiang Mai weather is hot and consuming ice cream popsicle is a great excuse to stay cool. 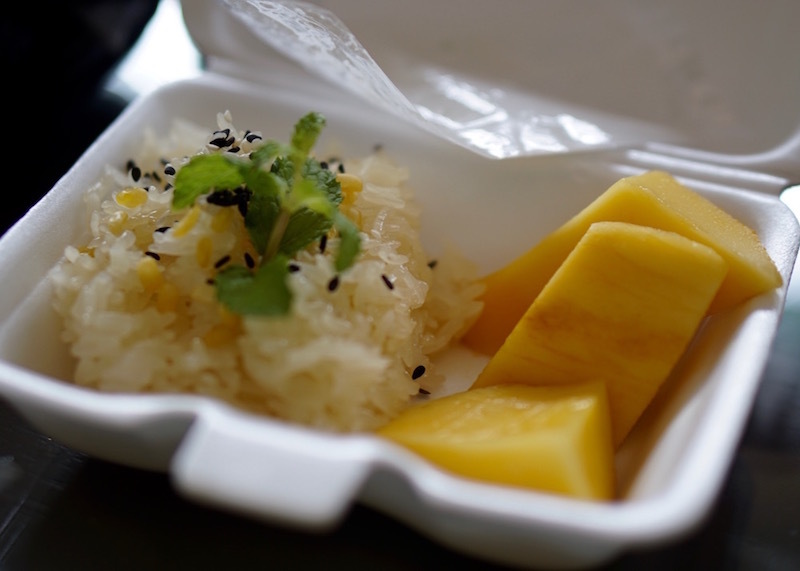 Mango sticky rice is a classic Thai dessert that is satisfying and is a typical street food in Chiang Mai. 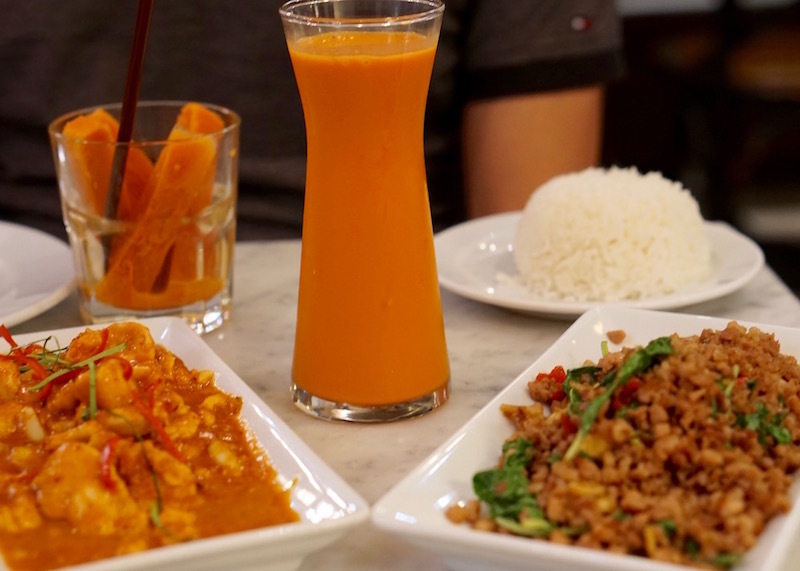 This flavourful treat is made with glutinous rice, fresh mango and coconut milk cooked in banana leaves. I was happy to come across a shop that served Korean bingsu dessert since it is rare to find other ethnic desserts in Chiang Mai. Also, I wasn’t particularly pleased the first time I tried bingsu in Singapore, namely because I didn’t do a good job picking toppings. This brownie bingsu totally redeemed itself; I am now a bingsu fan. 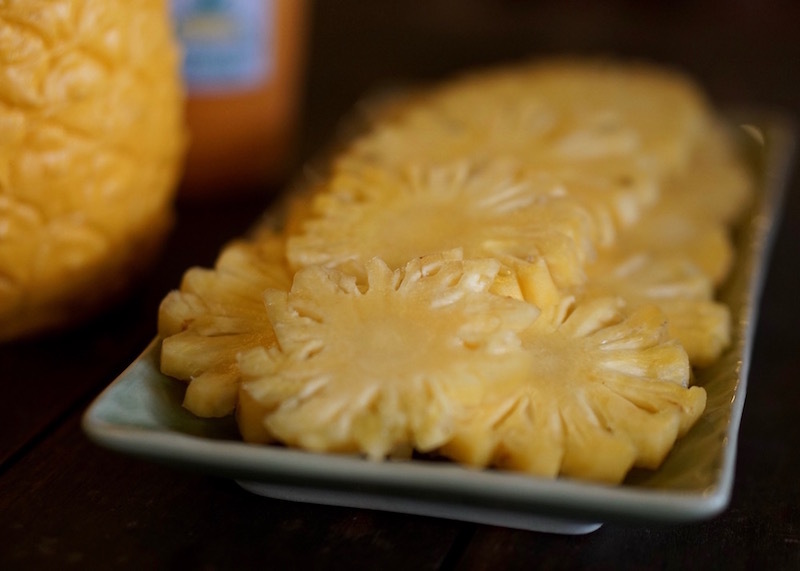 This cute mini pineapple is a must try if you like pineapple. Unlike its larger counterpart, this mini fruit is crunchier and a tad less sweet. I have no idea what the price of this fruit is since our tour guide graciously bought some for us, but seeing how inexpensive fruit is in Thailand, I imagine it’s a very cheap eat. 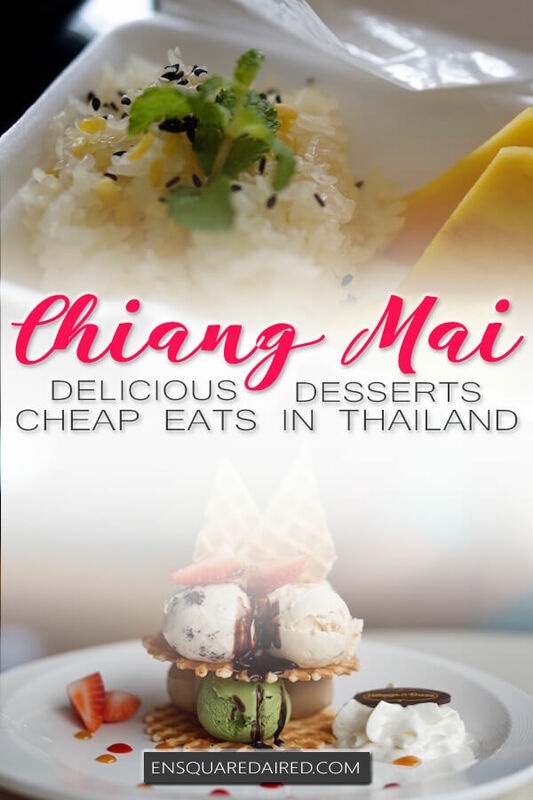 You will notice from my Chiang Mai street food post that dessert is pricey compared to regular meals, sometimes costing two to three times more than a regular meal. My tour guide during my Chiang Rai trip speculates it’s due to sugar and dairy being more expensive than other ingredients. 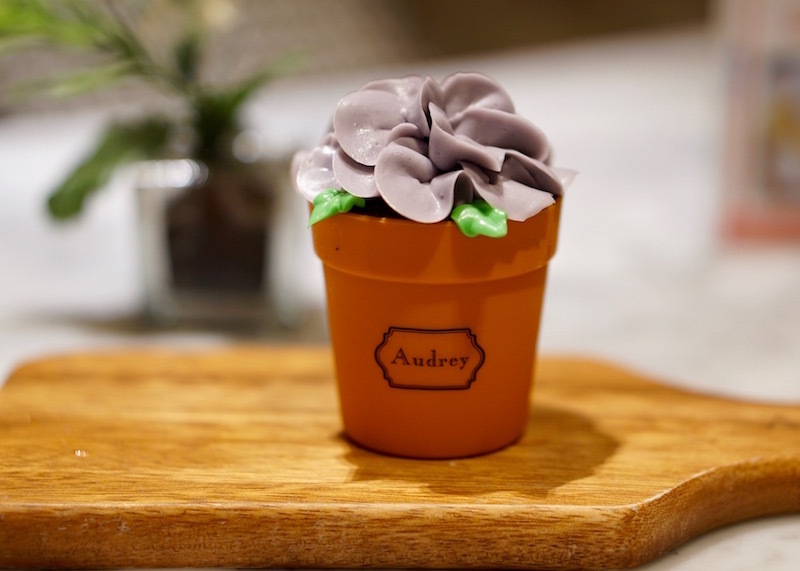 Either way that shouldn’t stop you from trying these delicious desserts.